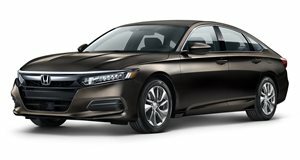 The Honda Accord has long been known for its sporty nature, an often rare trait among mid-size family sedans. According to , Honda will reveal the this fall, but already some major details are coming out. For starters, the V6 engine is a goner. In its place will be a new turbocharged 2.0-liter inline-four, which has been confirmed to use the same block as the 2.0-liter in the new . However, the turbocharger hardware will be different and owners will be able to use regular gas. The 2018 Accord’s base engine will be a turbo 1.5-liter four, the very same engine found in the base Civic and CR-V. There will also be a hybrid version, which is said to be an updated setup of the current car, which makes 212 hp and delivers 49/47 mpg city/highway. As for transmission offerings, the base gearbox will be a six-speed manual, which can be mated to both the 1.5 and 2.0 turbo fours. It won’t be offered on the hybrid. The optional gearboxes will be a CVT and a 10-speed automatic on the 1.5 and 2.0, respectively. Regarding output, the Accord’s turbo 2.0 won’t be as powerful as the one found in the , which has 316 hp. The current Accord V6 has 278 hp, so chances are the new premium engine option will be around 300 ponies. So, on the one hand, it’s great to see Honda sticking with the stick for not just one but two engines. The downside, of course, is the V6’s departure, but this shouldn’t be too surprising. Rivals such as the Chevrolet Malibu, Hyundai Sonata and Kia Optima have also all ditched V6s. To its credit, the V6 returns in the also recently redesigned Toyota Camry. and so many before it, the 2018 model will be assembled at Honda’s Marysville, Ohio production plant. More details will likely drop throughout the summer.